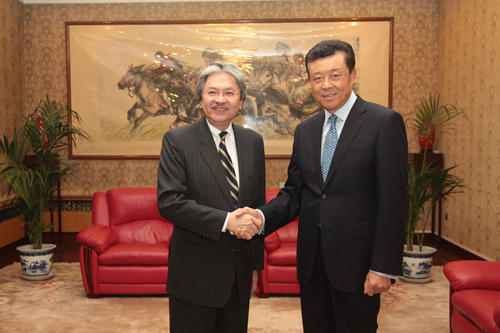 On 31 October 2014, Ambassador Liu Xiaoming met at the Embassy with the visiting delegation led by Mr. John Tsang Chun-wha, Financial Secretary of Hong Kong SAR Government. The meeting was also attended by Ms. Linda Lai Wai-ming, Special Representative for the Hong Kong Economic and Trade Affairs to the European Union, and Ms. Erica Ng, Director-General of the Hong Kong Economic and Trade Office in London. Ambassador Liu welcomed Financial Secretary Tsang’s visit to UK, and briefed the guests on the Decision on Comprehensively Advancing the Rule of Law of the Fourth Plenary Session of the 18th Communist Party of China Central Committee. He pointed out that according to the Decision, the practice of “one country, two systems” must be guaranteed in accordance with the law, the principles of “one country, two systems” and “Hong Kong people governing Hong Kong” with a high degree of autonomy comprehensively and accurately implemented, and the Constitution and the Basic Law strictly followed. The Decision also provides to improving institutions and mechanisms related to the implementation of the Basic Law, exercising central power and guaranteeing a high degree of autonomy according to law and supporting Chief Executive and the government of the Special Administrative Region to govern according to law. Ambassador Liu said, we firmly oppose “Occupy Central” and all kinds of illegal activities in Hong Kong that disrupt Hong Kong’s law and order, and strongly support the lawful handling of the illegal activities by the Hong Kong SAR Government led by Chief Executive Leung Chun-Ying, to safeguard social stability and safety and property of citizens in Hong Kong. Ambassador Liu emphasized, the Decision explicitly states to prevent and oppose foreign interference in Hong Kong affairs and maintain long-term prosperity and stability in Hong Kong. Hong Kong is China’s Special Administrative Region. Hong Kong affairs fully fall within China’s domestic affairs. Hong Kong’s political reform must follow the Basic Law and the related decisions of the Standing Committee of China’s National People’s Congress. No foreign government or individual has the right to intervene. We have stated China’s position clearly to the UK Government, and urged the British side to be prudent with words and deeds and refrain from intervening in Hong Kong affairs or interfering in China’s internal affairs. We have expressed our solemn position to British Parliament that the Chinese side opposes the so-called Kong Hong related “inquiries” or House of Commons Foreign Affairs Committee conducting “investigation” in Hong Kong. Ambassador Liu expressed the hope that Financial Secretary Tsang would seize the opportunity to give an introduction to the successful practice of “one country, two systems” in Hong Kong and its important role in maintaining the economic prosperity of Hong Kong, report the mainstream Hong Kong public opinion of seeking stability and opposing “Occupy Central”, and make it very clear that the Hong Kong SAR Government opposes any foreign interference in Hong Kong’s internal affairs. Secretary Tsang agreed with Ambassador Liu. He said that from what he sees and hears during his European visit, the industrial and commercial circles of European countries do not approve of the illegal activities of “Occupy Central”. They hope to see stability and prosperity in Hong Kong, aspire to grow economic and trade relations with it and want to enter the mainland and Asian market with Hong Kong as a platform. Tsang said while in the UK, he will have extensive contact with British people from all walks of life and convey the positive message that the SAR Government has the confidence and capability to maintain the stability and prosperity in Hong Kong.